Playwright-director John Rosenberg brings his series of long-form interviews with varied creators and theater peeps to Phindie with an extended interview of Tina Brock, artistic director of Idiopathic Ridiculopathy Consortium. 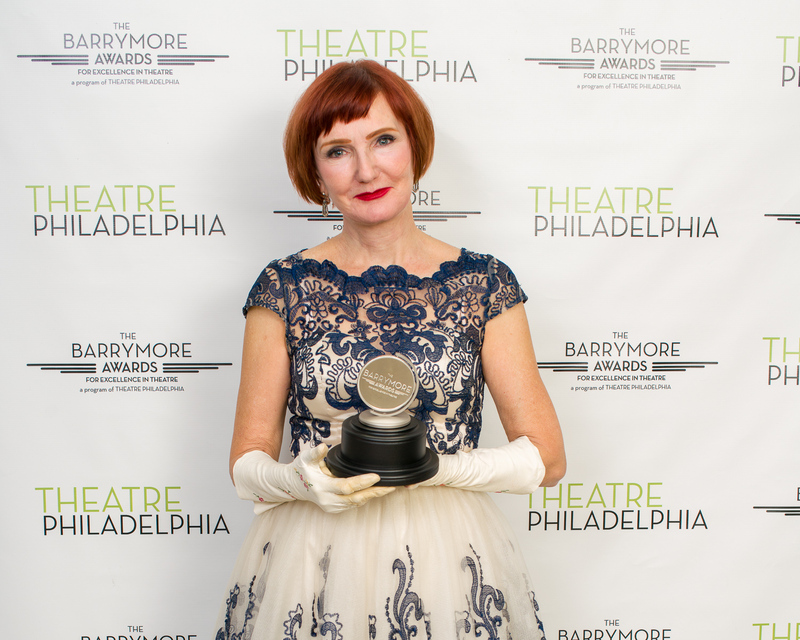 Tina Brock with her 2018 Barrymore for Outstanding Supporting Performance in a Play. Photo by Mike DiFebbo. Tina Brock: Philadelphia resident for over 30 years. Introverted. Theater-goer, a classic movie fan. Best day: reading a play, drinking coffee, visiting a museum, seeing a play, acting in a play. Sports and dance lover — to play and to observe, especially snow skiing and gymnastics (in earlier times) and ballet. Enjoy the films of Joel and Ethan Coen, Wes Anderson and Tim Burton and many others. Best outside the US vacation: London and Paris, to visit my son in school; favorite inside the US vacation: New York City, often as possible, to visit my son, now out of school. Love all forms of music. Drawn to structure: life, design architecture. Find comfort in those areas. John Rosenberg:Why did you say it like that? Tina Brock: Seem as though knowing how a person chooses to move through their day, where they are most comfortable tells you a lot about who they are. John Rosenberg:How did the company land on the name of Idiopathic Ridiculopathy Consortium? John Rosenberg: Were there other names in the running? Tina Brock: No. This was the title of an early play I wrote, a farce set in an infertility clinic, entitled Idiopathic Ridiculopathy. John Rosenberg: What happened in it? 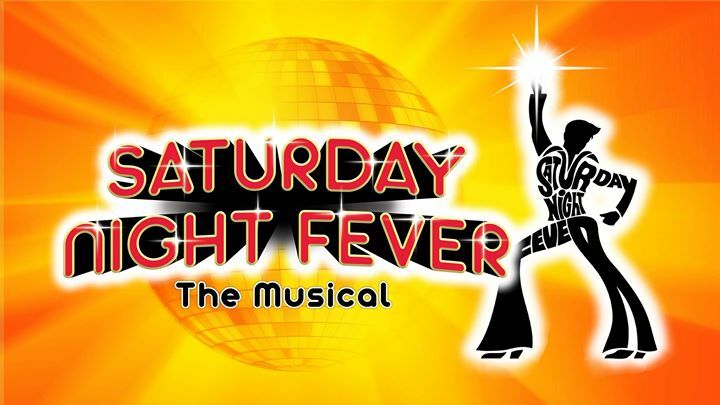 Tina Brock: It’s been years since I’ve read it, so not sure if what I’m remembering was the real deal or the play, but I remember a farce involving many doors, switch ups of samples delivered to the wrong hands in and a mysterious government agent. John Rosenberg: What do you think was your first brush with absurdism? Tina Brock: A car accident in high school that, while more horrific than absurd, certainly featured an existential, surreal, storyline that defined the years that followed. A less dramatic though still important early impression was the double fire baton twirling in the band front in high school which was at once terrifying and ridiculous. John Rosenberg: Does your personal life mirror the work you choose to produce? Tina Brock: It’s not so much the steps of my world every day, it’s the lens through which I see the world that appears to be different. The world often (pre the last election, more so know) seems terribly out of kilter. I discovered Eugene Ionesco, Franz Kafka, Samuel Beckett — those worlds seemed true to me, not off-kilter. John Rosenberg: How does IRC go about deciding on their seasons of work? Tina Brock: I keep a running wish list of plays and authors of interest, depending on where the world is, what the feeling is, depends on when the play is right for consideration. Depending on who else is producing what’s on the list and what the IRC can add to this community given the slate of work already on the table. For 2019 and moving ahead, reading plays outside the traditional absurdist canon, to mine for absurd elements and situations ripe for interpretation through the IRC lens. 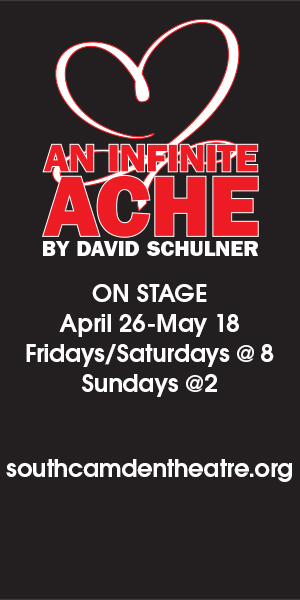 We added a third show to the 2019-2020 season, a hope moving ahead is to have one “traditional more firmly rooted in absurd canon”, one “out there farce/wacky absurd comedy”, and one “there’s nothing remotely absurd about this play” play to see where there might be chances to illuminate the absurdity. John Rosenberg: That is interesting you choose plays which don’t seem to have any absurd elements. It seems a great check on the company to continually prove yourselves and not rely on a set canon. What are some of the plays you have produced that fit this model? John Rosenberg: What absurd elements did you pull out of them? Tina Brock: We highlighted the fantastical elements, used puppets + tapped into the nuttier sides of the characters, hired the right actresses/actors who could bring those aspects to the forefront. In Eccentricities, there’s a scene featuring a church group meeting where there is great effort to put on airs, a meeting that goes very wrong – here I wanted to cast people with the right sense of humor and sensibility. Also staging the show in a location where the surroundings influence the absurd aspects of the text. 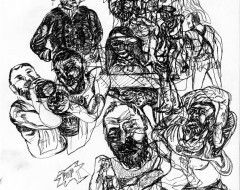 Eccentricities was staged at Bethany Mission Gallery the collection of outsider art resonated/framed the story and lifted the more absurd scenes off the ground. 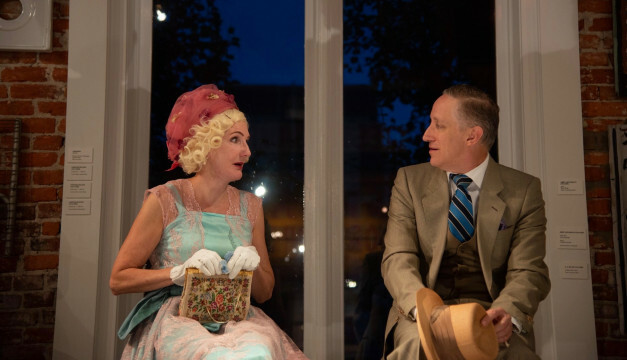 Elmer Rice’s Dream Girl takes place in NYC in the 1940’s – we’re staging this in a neo-Gothic Church that has the bones and scale of NYC, the best way to get the feeling of grand scale architecture/existential questions the play calls for on a tiny budget. Because the play deals with living one’s life in the present, not missing opportunities, there’s a resonance that happens when the text is spoken in a Sanctuary. Tina Brock and John Zak in ECCENTRICITIES OF A NIGHTINGALE. Photo by Johanna Austin Art. John Rosenberg: What has been the closest you have come to imagining something in your mind and seeing it manifest in reality? Tina Brock: When I used to be in competitive gymnastics we used visualization to guide us through maneuvers in warm up, say on the balance beam or floor exercise. At the end of the day, I try and visualize the best case scenario for what I feel may be difficult or challenging events the next day – this helps to focus my mind and a plan to move through, almost like a horse with blinders on? At times there’s so many issues and decisions just to keep the company moving ahead (first three show season in 13 years) + the desire to expand the staff and company, which requires more grant writing. It’s all overwhelming at times and I need to imagine big, though need to be able to turn the ideas into practice actionable pieces or I will get swamped. Imagining the steps of the outcome helps me to deal with the anxiety. And then it allows for letting go and seeing how the day/the work/the difficult issue plays out. John Rosenberg: How did you move from competitive gymnastics to acting? Tina Brock: I wasn’t good enough to continue competitive collegiate gymnastics, so combined my love of ballet and dance in college which led to theater. John Rosenberg: What are you striving for in competitive gymnastics? In gymnastics, I know there is the ever elusive perfect score, but many times or every time I watch the Olympics, the focus of the commentary is pointing out the flaws in performance. Tina Brock: Gymnastics was about working on mastering a sport that I realized I could only go so far with – I knew I would not be a big league college competitor, though I was able to tackle technical challenges, some anxieties and challenge myself to go as far as I could. I enjoyed being part of a team working towards a goal. It was the same with ballet – being part of a company of people each doing their part to make a greater thing. The pointing out the flaw thing can go with the territory – certainly in ballet and in gymnastics my coaches were solely looking to improve the form, and in doing so, in improving the structure, this allowed greater passion and channeling of feeling. It is also an aspect very prevalent in the way I direct, an aspect that not everyone understandably is excited about. I love the specificity of gymnastics and ice skating though appreciate most when the artistry is not purely technical, but shows the personality and artistry of the athlete. John Rosenberg: What are you striving for in your performance as an actor? Tina Brock: To connect as fully and truthfully with myself, and those on stage as I can; to continue to explore those avenues to see where they lead in each performance, and to translate that to an audience in a way that they can understand the character in service of the storytelling. John Rosenberg: What do you think about when you are acting? Tina Brock: Recently listened to an interview with Irish actress Lisa Dwan. She likened her work/process in the short Beckett pieces as feeling “elemental”. I identified with that characterization – of finding and holding on to the place of being that is right in that zone –the intake of information through the senses and then the response, through language and feeling and expression. Just being right there on the edge. After all the work has been done, the lines have been learned, the letting go place in that space where the mind isn’t interfering with the process. Of course other information is coming through – “Oh lord, my dress is unzipped, or “what is that annoying thing hanging off the back of my dress?” (it was a chicken bone, unknowingly picked up in an alley, preshow, but more on that later) and those thoughts have to be dealt with. But mostly I’m striving to experience the character and the world for the first time and work deeper each time to explore the connection with the other characters and myself. It feels like jumping off a cliff every time. John Rosenberg: What do you do when you are on-stage and things go wrong? Tina Brock: Try and integrate the mistake so it’s not evident it’s a mistake; the remedy depends on how colossal the mistake. But usually just integrate and invent a solution. John Rosenberg: Do you attempt to change the energy or you have to accept it? John Rosenberg: How do you direct yourself in your productions? 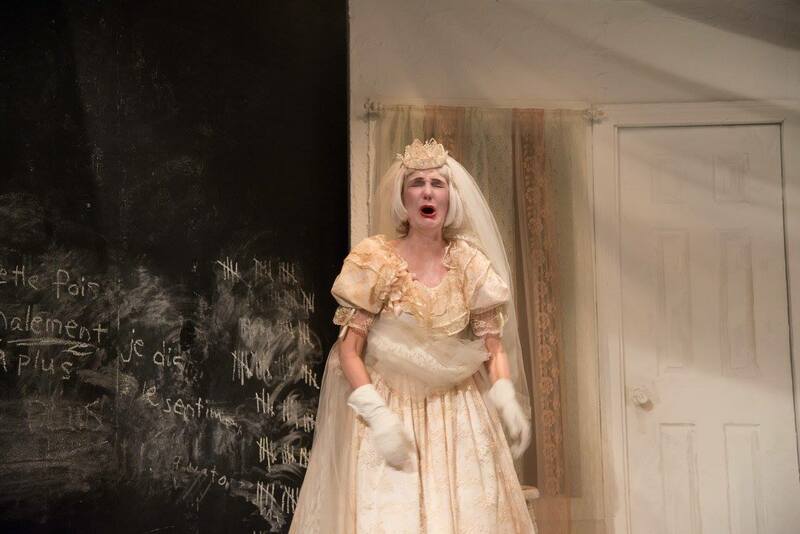 Tina Brock: Mostly I work often and early before rehearsal begins, a lot by myself at home, rehearsing the lines having recorded the whole play on my iPhone. I play the scene as if my scene partner were in the room, focusing on working as deeply as possible in those outside rehearsals so when we’re in the room I can gauge my progress. If I have questions, I check in with others in the scene, outside eyes. Generally you can see where it’s all headed, you can feel it. If there’s work to be done I go back to the drawing board and refine the approach and test it out at the next rehearsal. This means learning the lines very early so that I’m ready to explore the depth of the scene. John Rosenberg: How do you communicate with actors you direct? Tina Brock: I’m not the best communicator with language — better at drawing the note or showing it in the body. Have used the blackboard at rehearsal at times to draw the pattern desired — as in a football play. For blocking, it’s easier to demonstrate the move or the feeling by way of dance – to communicate it though my body, because you get emotion and form – which can be annoying to people. It’s the conundrum Ionesco alluded to — that language is an insufficient vehicle for communication. John Rosenberg: Is there a classic movie you have never seen and you know you have to see it but refuse? John Rosenberg: I don’t know who in their right mind would consider that a great movie. What do you think happens in the movie? Tina Brock: I don’t suspect it’s at all a great movie. I’ve heard people call it Classic, though not in the sense of best movies of all time, more because it’s identifiable and part of the culture. My guess is the plot is the title: hijinks ensue between fraternities, people drink too much, jump out of windows and get nuts. On the original question, (you know you have to see it but refuse) there’s no classic movie that I refuse to see; it’s more I haven’t seen some important ones because time hasn’t permitted. As my mom was getting near to the end of her life, we would watch Turner Classics and really bad old westerns together, which revealed how valuable this activity was on many levels, artistically and personally. Tina Brock in THE CHAIRS, 2016. Photo by Johanna Austin. John Rosenberg: Do you have a code you attempt to live by? John Rosenberg: How many different versions of you are there (that you are aware of)? Tina Brock: Several — probably three, depending on how stressed I am. John Rosenberg: Who are the members of IRC that keep things competent and comfortably absurd? John Rosenberg: Do you ever apply for a grant by sending in a banana and a check for $50,000? Is applying for grants in itself an absurd endeavor for you? Tina Brock: No, but that’s a great way to pay it forward! John Rosenberg: Yes it is. Tina Brock: On one hand it helps to think through in writing what makes the work matter to you and to others, but on the other hand the hours that go into it I often wish could just be put towards making the work better. John Rosenberg: What led you to starting IRC? Was it a desire to create your own work? Not seeing the theater you wanted to see being produced elsewhere? Tina Brock: In acting class in the 1990’s, we were exploring asburdist works, two responses surfaced — people felt we had a facility for interpreting, and no one else wanted to work on (perform) or direct them. I wanted to be able to see and create these works locally so we decided to test out the waters and see if audiences responded. We experimented and built it and see if people were interested in the work. John Rosenberg: Are there small companies just starting out that remind you of stages of development you have been before? Tina Brock: There many younger companies that are further along in organizational development than we are. The question, “what does growth mean/what is the endgame” is interesting and one we kick around a lot. Growing our budget slowly over 13 years and selecting the material carefully has never netted us a huge loss from a show, and with 70% of the budget coming from ticket sales and individual donations, that puts the pressure on to make selections that have to perform at the box office. I would like to have a little budgetary breathing room to experiment more. John Rosenberg: What has been the evolution of IRC productions? Have there been jumps in budgetary spending on shows as years went on which created more polished work? Or does money not affect the quality? Tina Brock: A few jumps in spending, mostly in the performer fees. The IRC’s budget has grown slowly and incrementally with the biggest jumps in income being through individual giving. I’m not sure in our case money has had much to do with raising he quality over the years, it seems it’s trial and error and making the right choices in material and performer– it certainly can assist to have the finances to be able to use as many Equity contracts as we can afford, that is one change, though not for every show. I want to put the money towards the designers and performers, and hopefully this year, towards IRC’s first General Manager. The challenge on a small budget is to interpret the design and deliver in creative ways. It’s exciting to see a little money go a long way. In our case, we are at the place where more support will enable us to grow of the company of performers – it will enable paying higher fees to both non-Equity and Equity which is where we need to head. John Rosenberg: What IRC production do you hold in the highest regard? Tina Brock: Many, thought for different reasons at different stages in the company’s growth and in mine — some for being bold on a budget; some for taking huge risks at an early place the company’s growth; some for pushing the boundaries of the performers and myself as a director; some for presenting absurdist texts that were incredibly difficult to interpret; some for the ability to choreograph massive casts and massive amounts of chairs in Walnut Street Studio 5; some for pushing myself and the cast to new depths as performers; some for the sound design; some for the feat of fitting difficult shows in more difficult spaces; some for the audiences who make the show greater than the sum of its parts. Each one has had it’s special gains and reasons why it was successful. I’ve never thought about a show at the end of a run, “gee — that experience I could have done without.” Aspects of the experience, sure — but the totality of it, no. John Rosenberg: What is your relationship to reviews of your productions? Do you not read reviews? Do you take to heart what is written? Tina Brock: I look forward to, and read, all of them. It’s an important learning tool for me. If a critic is going to take the time to see an IRC show, given the 100’s of requests to review shows they have coming in, of course I’m going to pay attention to the review. It’s an important way to learn about our work in relation to not only what’s happening in Philadelphia, but regionally, and around the world. I read all the reviews of shows I’m considering producing as well — since many IRC productions are written by European authors, interested in the interpretation and the critical and audience. Yes, I very much take to heart what is written for future productions and for the betterment of the company. If I don’t listen and consider the feedback from critics, I’m not sure where that feedback is going to come. Box office numbers are terrific indicators of something, though feedback on deeper artistic questions for the production and company aren’t measured by sales. John Rosenberg: What are some of the stranger things that have happened during productions? Tina Brock: Once I played Nell (Hamm’s mother) in Endgame. Since there was no trap in the theater, we had to get into the trashcans before the house opened. I spent time in the can with a book and a book light and a cup of coffee. After Nagg and Nell died, unbeknownst to me, the coffee cup fell over late in the play, there was only just a bit left, and the liquid oozed out of the bottom of the can and began to run down the floor, leaving a puddle in front of the trashcan. As though Nell was decomposing. John Rosenberg: I thought you were going to say you fell asleep in the trashcan in the production of Endgame. Do you remember what book you were reading? Tina Brock: Ha! No it was the opposite. Being in the confines of the trashcan compressed the experience making it more emotional, heightened in every way. The limitation, the claustrophobia, the structure, did interesting things to the work. It was also interesting to hear what audiences would talk about in preshow for Endgame without knowing anyone was in the trashcan listening. I do remember — reading a book called Flow. 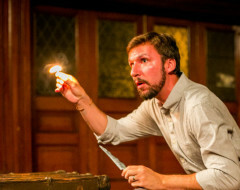 John Rosenberg: Do you say Macbeth in a theater? John Rosenberg: What have you never done? John Rosenberg: Who are some of your favorite actors to work with? 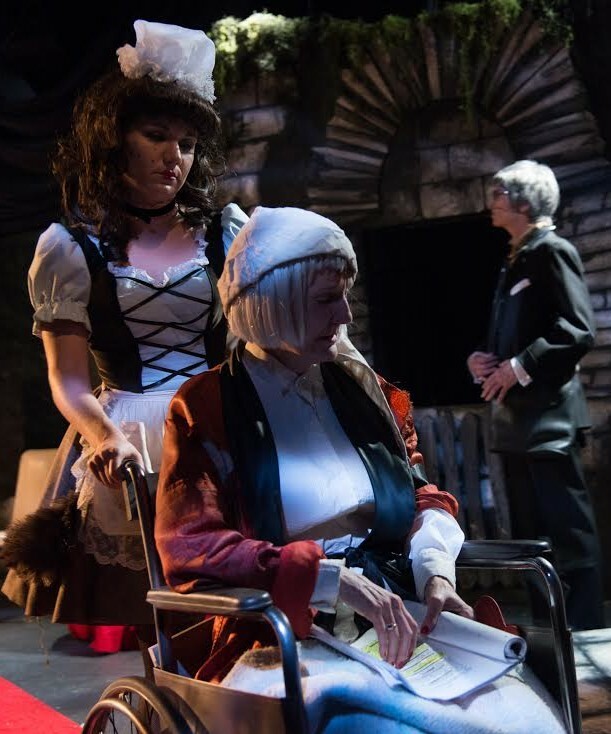 Tina Brock as the King in EXIT THE KING, wheeled by Jenna Kuerzi, 2015. Photo by Joanna Austin. John Rosenberg: Is there a colossal absurd text you have not tackled yet? John Rosenberg: What is (being) stressed (for) you like? Tina Brock: It feels like too many roads converging at once: (usually in rehearsal, not as a performer, as a director) the inability to process the flood of information coming in as to which is the biggest issue that needs to be solved first. And then, how to communicate that direction is a clear way. Which I believe comes from a worry about the amount of feet on the ground and whether we can pull off the show, not because of vision, because of lack of finances for proper support. I long for the day where an AD and support staff can help that process. When I can breathe, and let the information flow, there’s nothing causing stress — support will help make that possible; it’s what we’re working towards in 2019. John Rosenberg: What impact have your productions had on the people who come to see your work? Tina Brock: Audiences seem to appreciate what we bring to the party; IRC audiences are terrifically curious, loyal, very supportive. They enjoy talking about the experience, how they interpreted the production, the choices in casting and design. I hope we are introducing people to works they might not experience otherwise; we are certainly trying to select works that might not get produced if we don’t do them. 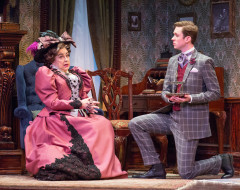 John Rosenberg: How much do shows typically cost IRC? If that is privileged information, you don’t have to tell me the truth. John Rosenberg: Was there a group of writers who were considered absurdist before the 20th Century? I might be asking the question clunky, but obviously the idea of the meaningless of life had to have been in the realm of human thought or belief. What changed or resonated or was so revolutionary with writers such as Albee and Beckett? Tina Brock: Certainly Kafka, Alfred Jarry (Ubu Plays) and other writers were alluding to the questions of the absurdity of existence long before, though I’m surmising that the war had a lot to do with the lens through which we began re reevaluate our lives and the meaning. In these works the form was so different, the play with no plot, no resolution. It seems a little like now – how the political situation has resulted in people reevaluating their choices and how they move through their lives, what’s important, what they care about. And how meaning often comes in between the lines, not on the line. John Rosenberg: What patterns of behavior in your life you recognize? John Rosenberg: What adorns the walls of your home? Tina Brock: Books; a bonsai tree on a shelf, old clocks that don’t work, a photo from Eugene Ionesco’s book cover Notes & Counter Notes; a sketch of a pond my brothers and I used to skate on in Warsaw, Indiana; a graphic print of Buster Keaton, a black and white photograph of the canals in Amsterdam; color photographs of Paris. Photographs of great grandparents. 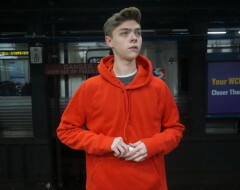 John Rosenberg: Is your son interested in following your path as an actor, director and producer? Tina Brock: Hmm, he hasn’t indicated that’s a path, though he pulled off a fine Willie Loman in his high school production. He possesses many talents: good writer, a great eye towards film and theater, it will be interesting to see where they surface in his life. He was hugely helpful in high school as a third eye on the IRC’s work. John Rosenberg: What do you think my son’s name is? John Rosenberg: No. Do you remember the first time you realized you were going to die? John Rosenberg: What is for dinner tonight? Tina Brock: Grape leaves, Gouda, and Tzatziki. Tina Brock: Take bigger risks.